Dr. Anthea Schick earned her BS degree in biology from U.C. Berkeley and her DVM from Cornell University. While at Cornell, she worked with some of the leading veterinary dermatologists in the country and decided to pursue a dermatology career. <br>After a one-year internship in small animal medicine and surgery in Albuquerque, New Mexico, she completed a three-year dermatology residency at Dermatology for Animals in Arizona. 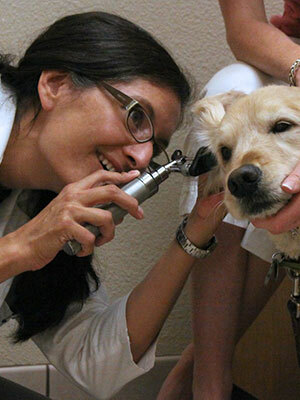 She became part owner of Dermatology for Animals in 2009, which now has practices in ten states.<br>Dr. Schick has a special interest in allergies and ear disease. She enjoys clinical research and teaching and is a preceptor for the Dermatology for Animals residency training program.